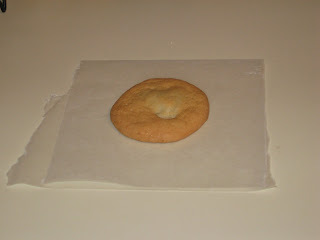 Cut sugar cookie roll into 12 equal slices. Break bar of chocolate into 12 equal pieces. If there are extra pieces left, well, eat ’em! Yum! If using M&Ms, you will need 36 of those suckers, 3 for each cookie. Place the chocolate in the middle of the slice and mold the dough around the chocolate piece. Make sure that it is completely covered by the cookie dough or else you’ll have quite a mess once they come out. Place the cookie balls (yes, they should look like semi flat balls once you’re done molding) onto an ungreased cookie sheet and bake for about 7 minutes or until the edges are lightly golden. The top if the cookie should not be golden! 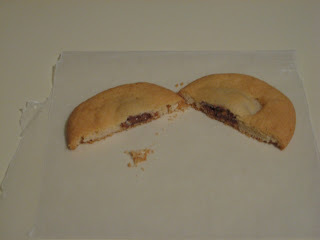 You will want to undercook them a bit since the chocolate is helping to cook the inside of the cookie. Place on cooling rack and consume! They taste best when you eat them about 2 minutes after they come out of the oven(mmmm gooey chocolate) but they are pretty yummy the next day. Disclaimer: These cookies are chock full of sugar….all kiddies should be given these WAY before bedtime so they can run all of that sugar out of their system. I gave sonny boy half a cookie after lunch because of this. Eat at your own risk!